, an English poet, the son of Richard Glover, a Hamburgh merchant in London, was born in St. Martin’s-lane, Cannon-street, in 1712. Being prot>ably intended for trade, he received no other education than what the school of Cheam, in Surrey, afforded, which he was afterwards induced to improve by an ardent love of learning, and a desire to cultivate his poetical talents according to the purest models. His poetical efforts were very early, for in his sixteenth year he wrote a poem to the memory of sir Isaac Newton, which was supposed to have merit enough to deserve a place in the view of that celebrated author’s philosophy, published in 1728, by Dr, Henry Pemberton. This physician, a man of much science, and of some taste, appears to have been warmly attached to the interests of our young poet, and at a time when there were few regular vehicles of praise or criticism, took every opportunity of encouraging his efforts, and apprizing the nation of this new addition to its literary honours. 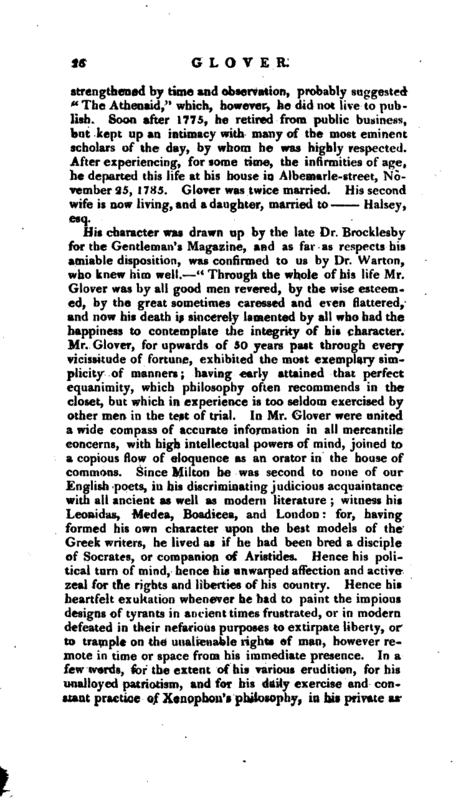 At the usual period Glover became engaged in the Hamburgh trade, but continued his attachment to literature and the muses, and was, says Dr. Warton, one of the best and most accurate Greek scholars of his time. 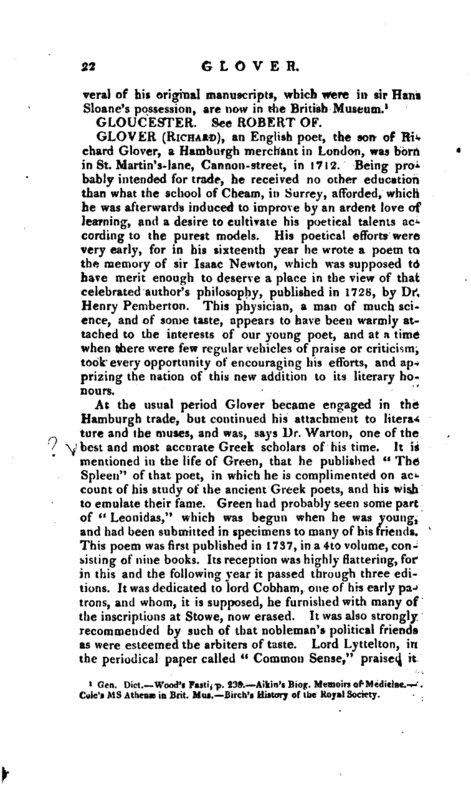 It is mentioned in the life of Green, that he published “The Spleen” of that poet, in which he is complimented on account of his study of the ancient Greek poets, and his wish to emulate their fame. Green had probably seen some part of “Leonidas,” which was begun when he was young, and had been submitted in specimens to many of his friends. This poem was first published in 1737, in a 4to volume, consisting of nine books. Its reception was highly flattering, for in this and the following year it passed through three editions. It was dedicated to lord Cobham, one of his early patrons, and whom, it is supposed, he furnished with many of the inscriptions at Stowe, now erased. It was also strongly recommended by such of that nobleman’s political friends as were esteemed the arbiters of taste. Lord Lyttelton, in the periodical paper called “Common Sense,” praised it | in the warmest terms, not only for its poetical beauties, but its political tendency, “the whole plan and purpose of it being to show the superiority of freedom over slavery; and how much virtue, public spirit, and the love of liberty, are preferable, both in their nature and effects, to riches, luxury, and the insolence of power.” The same nobleman also addressed verses to our author, in which he inveighs with much asperity against the degeneracy of the times, but, not very consistently, compares England to Greece, and France to Persia. 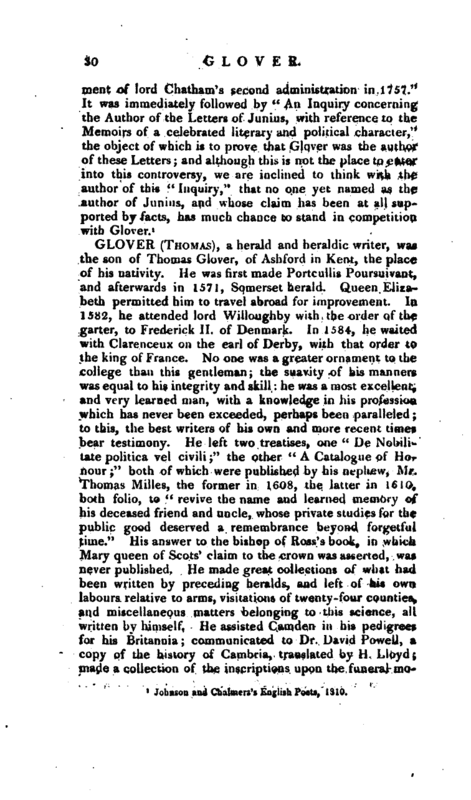 Other writers, particularly Fielding, in the paper called “The Champion,” took up the pen in favour of “Leonidas,” which being published just after the prince of Wales had been driven from St. James’s, and began to keep a separate court, it was praised by the whole of this new court, and by the adherents in general of opposition, not beyond its merit, but too evidently from a motive which could not always prevail, and which ceased to animate their zeal in its favour, when Walpole, the supposed author of all our national grievances, was compelled to resign. Amidst this high encouragement, the services of Dr. Pemberton must not be forgotten. Soon after the appearance of “Leonidas,” this steady friend endeavoured to fix the public attention on it, by a long pamphlet, entitled “Observations on Poetry, especially Epic, occasioned by the late poem upon Leonidas,” 1738, 12mo. In this, with, many just remarks of a general kind, the author carries his opinion of Glover’s production beyond all reasonable bounds. 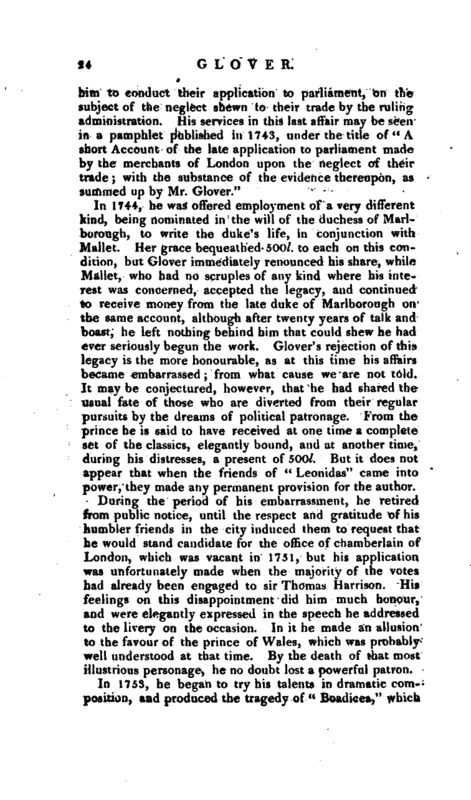 In the following year, Glover published “London, or the Progress of Commerce,” and the more celebrated ballad of “Hosier’s Ghost,” both written with a view to rouse the nation to resent the conduct of the Spaniards, and to promote what had seldom been known, a war called for by the people, and opposed by the ministry. 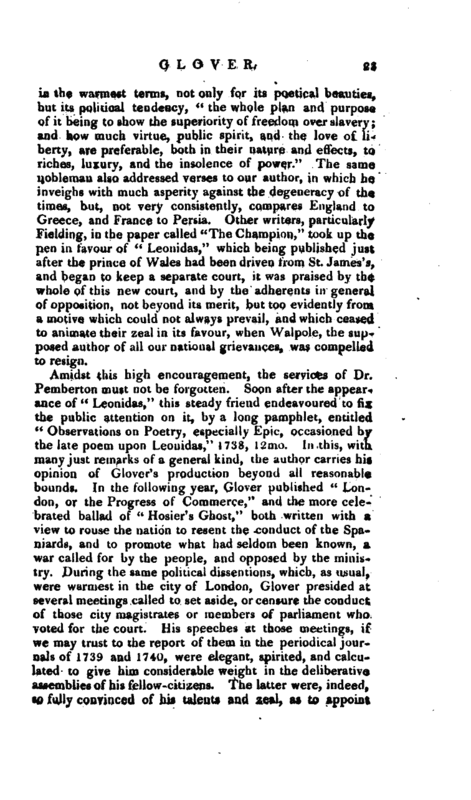 During the same political dissentions, which, as usual, were warmest in the city of London, Glover presided at several meetings called to set aside, or censure the conduct of those city magistrates or members of parliament who voted for the court. His speeches at those meetings, if we may trust to the report of them in the periodical journals of 1739 and 1740, were elegant, spirited, and calculated to give him considerable weight in the deliberative assemblies of his fellow-citizens. The latter were, indeed, so fully convinced of his talents and zeal, as to appoinfe | him to conduct their application to parliament, on the subject of the neglect shewn to their trade by the ruling administration. His services in this last affair may be seen in a pamphlet published in 1743, under the title of A short Account of the late application to parliament made by the merchants of London upon the neglect of their trade; with the substance of the evidence thereupon, as summed up by Mr. Glover." In 1744, he was offered employment of a very different kind, being nominated in the will of the duchess of Marlborough, to write the duke’s life, in conjunction with Mallet. Her grace bequeathed 500l. to each on this condition, but Glover immediately renounced his share, while Mallet, who had no scruples of any kind where his interest was concerned, accepted the legacy, and continued to receive money from the late duke of Maryborough on the same account, although after twenty years of talk and boast, he left nothing behind him that could shew he had ever seriously begun the work. Glover’s rejection of this legacy is the more honourable, as at this time his affairs became embarrassed; from what cause we are not told. It may be conjectured, however, that he had shared the usual fate of those who are diverted from their regular pursuits by the dreams of political patronage. From the prince he is said to have received at one time a complete set of the classics, elegantly bound, and at another time, during his distresses, a present of 500l. But it does not appear that when the friends of “Leonidas” came into power, they made any permanent provision for the author. During the period of his embarrassment, he retired from public notice, until the respect and gratitude of his humbler friends in the city induced them to request that he would stand candidate for the office of chamberlain of London, which was vacant in 1751, but his application was unfortunately made when the majority of the votes had already been engaged to sir Thomas Harrison. His feelings on this disappointment did him much honour, and were elegantly expressed in the speech he addressed to the livery on the occasion. In it he made an allusion to the favour of the prince of Wales, which was probably well understood at that time. By the death of that most illustrious personage, he no doubt lost a powerful patron. In 1753, he began to try his talents in dramatic composition, and produced the tragedy of “Boadicea,” which | was performed for nine nights at Drury-lane theatre. Dr. Pemberton, with his accustomed zeal, wrote a pamphlet to recommend it, and among the inferior critics, it occasioned a temporary controversy. Great expectations were formed of its success from the reputation of an author who had acquired so much praise from his “Leonidas.” At the rehearsal, he read his < Boadicea“to the actors, but his manner of conveying the meaning of his poem was very unhappy; his voice was harsh, and his elocution disagreeable. 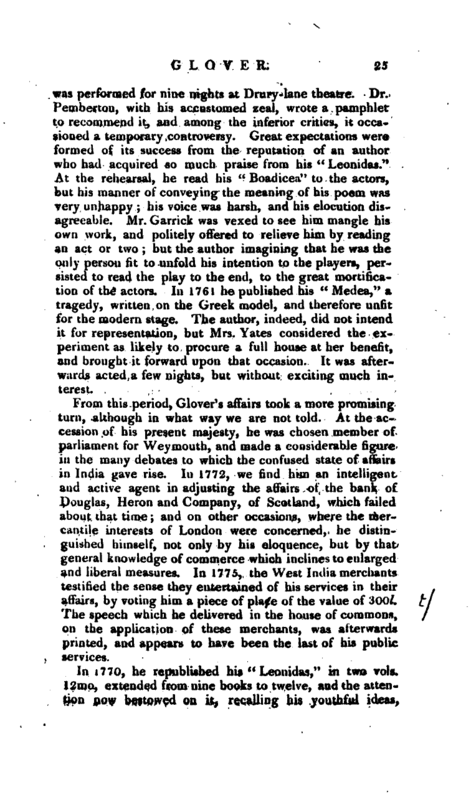 Mr. Garrick was vexed to see him mangle his own work, and politely offered to relieve him by reading an act or two; but the author imagining that he was the only person lit to unfold his intention to the players, persisted to read the play to the end, to the great mortification of the actors. In 1761 he published his” Medea," a tragedy, written on the Greek model, and therefore unfit for the modern stage. The author, indeed, did not intend it for representation, but Mrs. Yates considered the experiment as likely to procure a full house at her benefit, and brought it forward upon that occasion. It was afterwards acted a few nights, but without exciting much interest. From this period, Glover’s affairs took a more promising turn, although in what way we are not told. At the accession of his present majesty, he was chosen member of parliament for Weymouth, and made a considerable figure in the many debates to which the confused state of affairs in India gave rise. In 1772, we find him an intelligent and active agent in adjusting the affairs of the bank of Douglas, Heron and Company, of Scotland, which failed about that time; and on other occasions, where the mercantile interests of London were concerned, he distinguished himself, not only by his eloquence, but by that general knowledge of commerce which inclines to enlarged and liberal measures. In 1775, the West India merchants testified the sense they entertained of his services in their affairs, by voting him a piece of place of the value of 300l. The speech which he delivered in the house of commons, on the application of these merchants, was afterwards printed, and appears to have been the last of his public services. In 1770, he republished his “Leonidas,” in two vols. 12mo, extended from nine books to twelve, and the attention now bestowed on it, recalling his youthful ideas, | strengthened by time and observation, probably suggested “The Athenaid,” which, however, he did not live to publish. Soon after 1775, he retired from public business, but kept up an intimacy with many of the most eminent scholars of the day, by whom he was highly respected. After experiencing, for some time, the infirmities of age, he departed this life at his house in Albemarle-street, November 25, 1785. Glover was twice married. His second wife is now [] living, and a daughter, married to Halsey, esq. 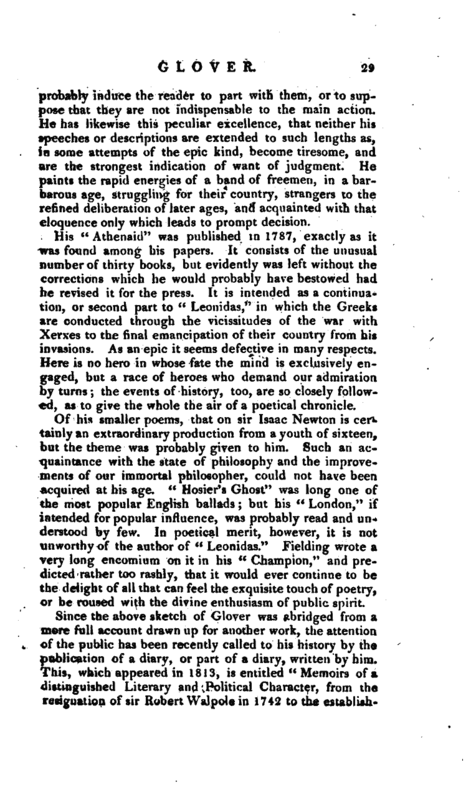 Glover’s “Leonidas” amply entitles him to a distinguished place among the poets of his country, but the public has not held it in uniform estimation. From the time of its first appearance in 1737, it went through six, if not seven editions; but for nearly forty years there has not been a demand for another, although that published in 1770 was highly improved and enlarged. Its history may probably account in part for this singular fate, and public taste must explain the rest. On its first publication, it was read and praised with the utmost avidity. Besides the encomiums it drew from Lyttelton and Pemberton, its fame reached Ireland, where it was reprinted, and became as much in fashion as it had been in England. 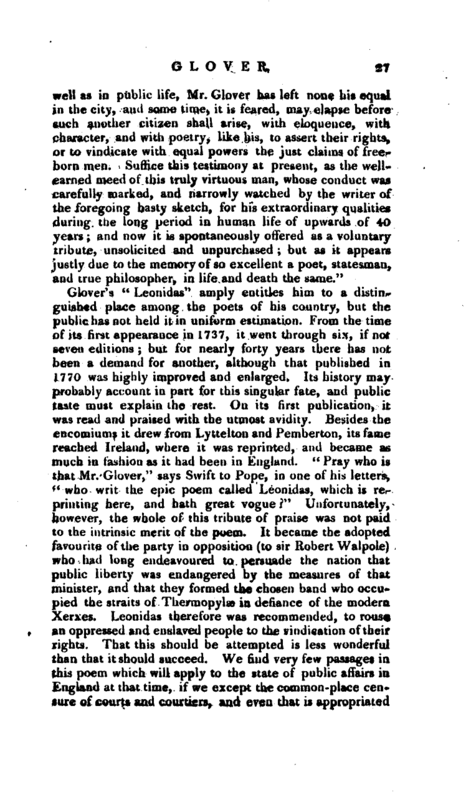 “Pray who is that Mr. Giover,” says Swift to Pope, in one of his letters, *' who writ the epic poem called Leonidas, which is reprinting here, and hath great vogue“Unfortunately, however, the whole of this tribute of praise was not paid to the intrinsic merit of the poem. It became the adopted favourite of the party in opposition (to sir Robert Walpoie) who had long endeavoured to persuade the nation that public liberty was endangered by the measures of that minister, and that they formed the chosen band who occupied the straits of Thermopylae in defiance of the modern. Xerxes. Leonidas therefore was recommended, to rouse an oppressed and enslaved people to the vindication of their rights. That this should be attempted is less wonderful than that it should succeed. We find very few passages in this poem which will apply to the state of public affairs in. England at that time, if we except the common-place censure of courts and courtiers, and even that is appropriated | with so strict historical fidelity to the court of Xerxes, that it does not seem easy to borrow it for any other purpose.” Nothing else,“however, Dr. Warton informs us,” was read or talked of at Leicester-house," the illustrious owner of which extended his patronage to all poets who fanned the sacred flame of patriotism. The consequence of all this was, that Leonidas, which might have laid claim to a considerable rank among English poems of the higher order, was pushed beyond it, and when the purposes for which it had been extolled were either answered, or no longer desirable, it fell lower than it deserved. This is the more justly to be regretted, as we have no reason to think the autlior solicited the injudicious praise of his friends and patrons, or had any hand in building the airyedifice of popular fame. He was, indeed, a lover of liberty, which has ever been the favourite theme of poets, but he did not write for a temporary purpose. Leonidas had been the fruit of very early ambition to be known to posterity, and when he had outlived the party who pressed his poem, into their service, he corrected and improved it for a generation that knew nothing of the partialities which first extended its fame. If his object, however, in this epopee, had been solely to inculcate a love of liberty, a love of our country, and a resolute determination to perish with its freedom, he could not have chosen a subject, at least from ancient times, so happily adapted to elevate the mind. The example was unparalleled in history, and therefore the more capable of admitting the embellishments and attractions that belong to the epic province. Nor does it appear that he undertook a task to which his powers were inadequate, when he endeavoured to interest his readers in the fate of his gallant hero and faithful associates. He is not deficient either in the sublime or the pathetic, although in these essentials he may not bear an uniform comparison with the great masters of the passions. The characters are varied with much knowledge of the human heart. Each has his distinctive properties, and no one is raised beyond the proportion of virtue or talent which may be supposed to correspond with the age he lived in, or the station he occupied. His comparisons, as lord Lyttelton remarks, are original and striking, although sometimes not sufficiently dignified. His descriptions are minutely faithful, and his episodes are in general so interesting, that no critical exceptions would | probably induce the reader to part with them, or to suppose that they are not indispensable to the main action. He has likewise this peculiar excellence, that neither his speeches or descriptions are extended to such lengths as, in some attempts of the epic kind, become tiresome, and are the strongest indication of want of judgment. He paints the rapid energies of a band of freemen, in a barbarous age, struggling for their country, strangers to the refined deliberation of later ages, and acquainted with that eloquence only which leads to prompt decision. His “Athenaid” was published in 1787, exactly as it was found among his papers. It consists of the unusual number of thirty books, but evidently was left without the corrections which he would probably have bestowed had he revised it (or the press. It is intended as a continuation, or second part to “Leonidas,” in which the Greeks are conducted through the vicissitudes of the war with Xerxes to the final emancipation of their country from his invasions. As an epic it seems defective in many respects. Here is no hero in whose fate the mind is exclusively engaged, but a race of heroes who demand our admiration by turns; the events of history, too, are so closely followed, as to give the whole the air of a poetical chronicle. Of his smaller poems, that on sir Isaac Newton is certainly an extraordinary production from a youth of sixteen, but the theme was probably given to him. Such an acquaintance with the state of philosophy and the improvements of our immortal philosopher, could not have been acquired at his age. “Hosier’s Ghost” was long one of the most popular English ballads; but his “London,” if intended for popular influence, was probably read and understood by few. 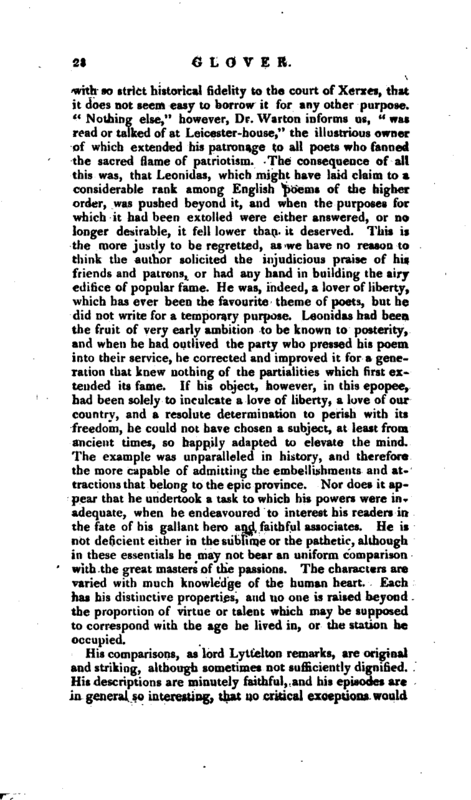 In poetical merit, however, it is not unworthy of the author of “Leonidas.” Fielding wrote a very long encomium on it in his “Champion,” and predicted rather too rashly, that it would ever continue to be the delight of all that can feel the exquisite touch of poetry, or be roused with the divine enthusiasm of public spirit. Johnson and Chalmers’s English Poets, 1310.